With clean energy dominating the news lately I wanted to talk about clean technology investing and the massive importance it is having in the financial markets as a whole. Much of the money being spent by the current administration in America is for clean energy – more wind turbines to lessen our reliance on fossil fuels as one primary example. With this colossal shift lies opportunity for investment vehicles to capture their part of the change to cleaner energy. Socially responsible ethical and ‘green’ mutual funds are gaining in popularity by individuals who want to invest their money in companies with a slant towards environmentalism. Other investors simply want to have their money exposed to a fast-growing area in the financial marketplace. Whatever their motives, investing in socially responsibility investment vehicles is on the rise, and because of this the Nasdaq and Deutsche Bank joined forces to create a new index that monitors the global clean technology sector. These two well respected financial institutions have created DB NASDAQ OMX Clean Tech Index (DBCC) which is made up of 119 companies with at least 33% of their revenues generated from clean technologies. Climate change is a threat to the world, there is no doubt about it in my mind. If these types of indices have been created, and new ethical mutual funds can easily be bought and sold in the marketplace, the business community has come a long way. These are by no means fly-by-night operations. 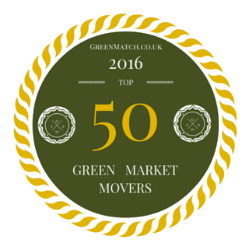 This is here to stay and the strength, size and scope of green business will increase at an alarming rate over the next few years. With Government money flowing into green technologies at a rapid rate and bright and ambitious entrepreneurs, coupled with well established and seasoned corporations getting on board, green business will thrive and may lead financial markets over the next decade.